This article is from 1907---I am adding some sources and additional genealogy. left one child, Rachel Swinerton who married in Boston Sept. 29, 1763, Nathaniel Child, one of the Tea Boys." "It does seem a bit singular," says Sam Walter Foss of Somerville, that the old Stearns house on Broadway should have remained practically undisturbed until the present times. But the contemplated improvements in terminal facilities at Sullivan-sq station will no distant day eliminate this old relic of revolutionary days and another historic Somerville landmark will disappear. The Middlesex deeds show that in 1761 Peleg Stearns bought of Samuel Sprague10 acres of land "with the buildings thereon," which were located "without the neck" and "along the Medford road." This unconditional method of description seems to locate the purchase of the present site of the Stearns house. Peleg Stearns came originally from Watertown. At the time of Bunker Hill battle, as the occupants of the farm on "plouged hill," he was a man 55 years. 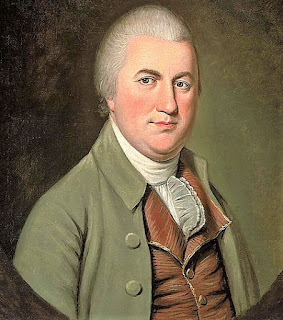 His wife was Elizabeth Swineton, a native of New London, Connecticut. When she married him she was the widow of an English soldier. 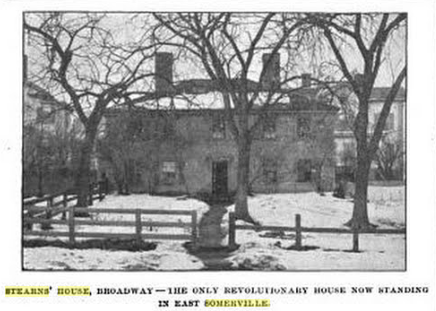 ......the house that Peleg Stearns bought in 1761 and which he was residing during that never forgotten day of June 17, 1775. As a matter of fact there were two houses on that property. In the famous Charlestown claim list in 1775, in which all inhabitants of the unfortunate town who sustained property losses of any kind recorded the amount of damages incurred, the name Peleg Stearns is the number 417 on the roll. The Stearns claim was based on the injury of two houses, two barns, fences and trees. The accident aggregated 775 pounds, 8 shillings, and 1 denarius----The "once pence" illustrated old New England idea of the thrift, which would exact the payment obligations of the last penny. The Stearns claim, in common with the other 480 claims aggregating $500,000 was never paid. As early as 1777, the Continental congress was petitioned for relief that body, however had all the money-raising it wanted to do in securing funds for troops in the field, and the request was denied. The people of Charlestown, like Peleg Stearns dearly paid for their patriotism of the June 17, 1775, and they managed to work out their own financial salvation. Peleg and Elizabeth had one son, William Stearns graduated Harvard college 1776. Bond in his Watertown history states that "the night before the battle of Bunker Hill, William was employed the whole night in throwing up breastworks, and, during the action, was taking care of his parents at their farm at Plowed Hill." 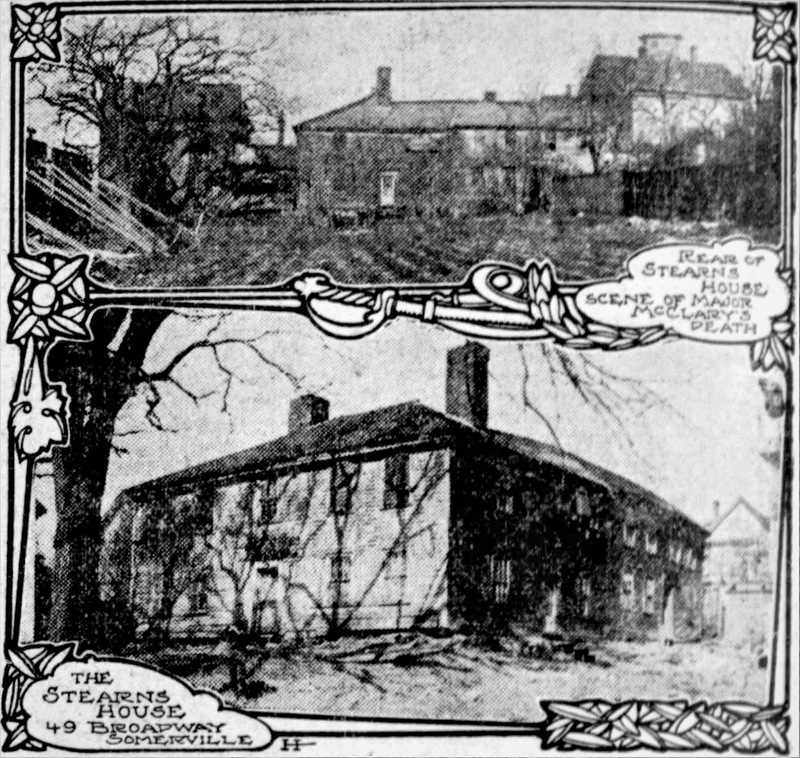 The Stearns home was not only in the direct line of enfilading fire from warships and floating batteries, but the whole region abounded in Massachusetts and New Hampshire troops. For it was in the backyard at the rear of the Stearns house that Major Andrew McCleary/McClary of Epson, New Hampshire, the major of Stark's first New Hampshire regiment met his death from a stray cannon ball from the enemies batteries. The conflict on the hill ended at 4 o'clock in the afternoon. The battle had raged for hours. There were at least two Massachusetts regiments "at the neck" at the beginning of the afternoon that blocked the roadway and it was this same Major McClary who dad to them: "If you men are not going on just stand on one side and the New Hampshire boys have a chance." After the tragic death of the major the Stearns house, without doubt, became deserted. Both combatants and non combatants fled to Winter Hill and beyond the firing range of the British guns. The houses, barns, and other farm buildings of the Stearns place doubtless presented a total wreck the next morning. The failure of the British to follow the route at Bunker Hill, the coming of Washington, and the American fortifications that everyone abounded, soon restored peace to a disturbed region. Peleg Stetson returned ti his house and resided there until his death in March 1789. His widow, a moth afterward. All the property descended to his son William, who by this time obtained a medical degree, and he was keeping a drug store in Salem, Massachusetts. With his wife, Sarah White Sprague who he married in 1781, Dr Stearns reared a family of 10 children. 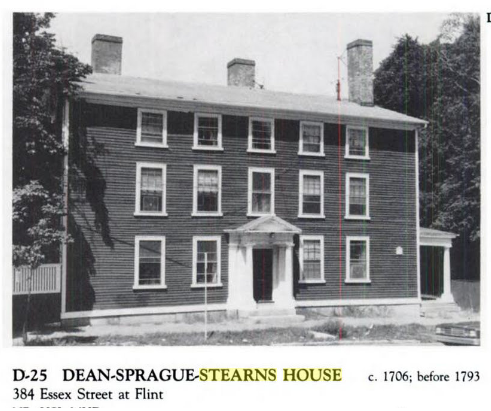 It was Sarah White Stearns, daughter of William, and born 1792, who was the last known Stearns occupant of the old Broadway house. "Aunt Sally" as she was called died many years ago and the property to this day is assessed to the "heirs of W Stearns." This W is for Dr William that was the the doctor of Apothecary in Salem. Tapley, Harriet Silvester. "Dr. William Stearns, Merchant and Apothecary with Some Account of the Sprague Family." Historical Collections of the Essex Institute 64 (1928): 1. Van Wagenen, Avis Stearns. Genealogy and Memoirs of Isaac Stearns and His Descendants. Syracuse, N. Y.: Courier Printing, 1901.